Today was the last for Steve Palmo and Mitch Wergiles as well as my last day. I could write a thousand works or more to summarize this trip, but I think the individual daily posts tell the story best. If you want to catch big striped marlin, blue marlin, black marlin, yellowfin tuna, wahoo, and too many other species to count, you need to experience the fishing in the Galapagos. The island of San Cristobal has everything you need including great food, rooms, and the friendliest people. The fishing is just one part of the overall experience. You can dive, snorkel, kayak, bike, and loads of other things all on this island. In my opinion, fishermen never need to leave here. Once again Pete Santini promised a shot at a blue marlin and delivered. The fish came up on a green Iland Express from Iland Lures. It was the last fish of the day and the lure was running short and the fish started jumping right in the spread before we ever had a chance to set the hook. It shook itself free in a few moments. It was if the Galapagos fishing gods were waving goodbye to me after my long stay. Mitch caught the first striped marlin no more than 10 minutes after we started trolling. 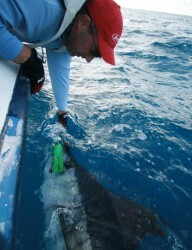 We had seven more hook-ups and Steve pulled the hook on a huge fish that took him down to the backing on a 50lb outfit. The fish were certainly more aggressive than the past two days and once again we saw more than 30. The bite came on strong at midday and in the midst of it a 70lb Wahoo jumped one the Iland Lures being run directly behind the teaser tight to the boat. The speed of a Wahoo is simply amazing, but it was no match for the 50lb outfit. It tasted great when they prepared it for us at the Miconia for dinner. 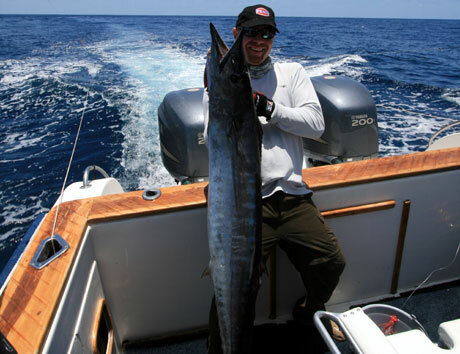 Steve Palmo scores with a big striped marlin, followed by Mitch Wergiles, and then Steve lands a big Wahoo. Steve is using his new “favorite” Black Magic Belt and Harness. That plate has a unique design that ensures the rod gimbal stays in place throughout the fight. Once he started using this on the trip, we could not get him to give it up and we only had one set.